I used to think that the worst thing about soccer was that it taught people to hate each other. After all, I thought, how much difference can there be between someone who lives in Liverpool and someone who lives in Manchester? Milanese football fans are not so different that the “rivalry” between Milan and Inter is anything but contrived. Seattle vs Portland reads like identical groups of PNW hipsters making up a fake internecine conflict just to have something to do on the weekends. Soccer, I used to think, had a capacity to take two groups of people who were basically alike and incite them to hate one another, and in so doing canceled out some of the good it otherwise creates in the world. I don’t believe that soccer teaches us to hate people anymore. Rather, I’ve come to the conclusion that soccer provides a platform for prejudice that’s already there. It provides a structure, amplification, competition and clear rules for how one side can “win.” You see this in any number of football rivalries around the world, from El Clásico to the Eternal Derby to the Old Firm. The hate was already there; soccer just gave it a scoreboard and a stadium. The truth is that when you look closer, you see that many major football rivalries are rooted in very real social divides. Celtic vs Rangers is a cipher for sectarian violence between Catholics and Protestants. Red Star Belgrade vs Partizan Belgrade grew out of competing anti-fascist youth movements in the post-war era. Liverpool vs Manchester United draws on the anxieties of industrial (and later post-industrial) British economy. And, of course, El Clásico is but the ritualization of violence by, and resistance to, a fascist regime that has not yet passed out of living memory. I don’t know if any of the violence and resentments that make up El Clásico could be or will be replicated in an American soccer rivalry now that the United States has its own Caudillo in Donald J. Trump. I doubt it, because of Major League Soccer’s corporatism and sanitized respectability politics. If anything like that does develop, it’ll be as an undercurrent, something that can’t really be seen if you’re watching at home on MLS Soccer Sunday. It might even manifest in one of the rivalries that doesn’t get a lot of attention, like the Chicago Fire vs the Columbus Crew. What better expression of the Red-Blue divide in this country than a rivalry between deep-blue Chicago and deep-red central Ohio? (Of course, it’s not quite that simple. Clinton didn’t get the blowout in Cook County you’d think she should have, while Franklin County was one of the few blue patches in Ohio.) Still, if you’re looking for our country’s political and cultural divisions to play out in domestic club soccer, it might not look like what you’d expect. If soccer can give form and amplification to our worst tendencies, the reverse must also be true. Real Madrid may have been an instrument for Franco’s power, but Barcelona found the strength to oppose him. Football ultras can be powerful organizations for anti-fascist movements. Fans of all stripes are taking stands against homophobia and coming together when hate claims lives. 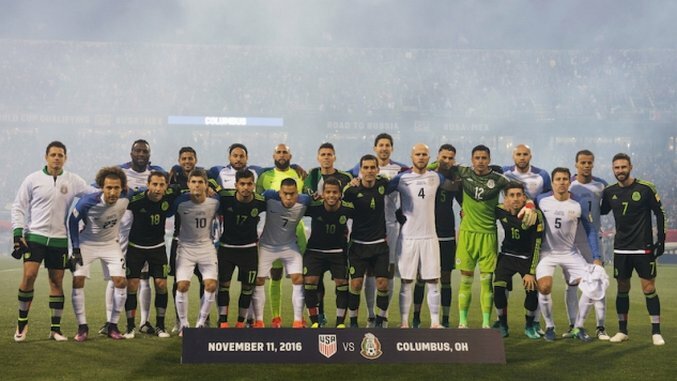 And before the USMNT kicked off against Mexico in Columbus on Friday, they built their own wall. Soccer has the capacity to aid and abet bigotry and fascism, as well as its cousins consumerism and performative moderation. But it can also be a vehicle for resistance. Football can be a place where people come together, where values are upheld and defended, and where vulnerable people aren’t left behind. It should not be assumed, however, that we will discover in soccer the better angels of our nature. Space in American society for marginalized people and democratic values is not given, it must be taken, and held on to. We must, all of us, commit to the work ahead and follow through. The forces of hate and chaos have all the momentum now, and fascism is the hot new trend this fall, not just here, but across the West. It’s no longer enough to assume your club or your supporters group will stand up for what’s right, or that soccer can be merely a distraction and a refuge from the troubles of the world. Many of the ideals you and I took for granted for much of our lives were held up for a referendum last week, and they lost. We can’t pretend nothing has changed or that this is all normal. Soccer can no longer be a distraction from the horrors to come unless you are truly committed to burying your head in the sand, and if you are, then there’s no help for you. But there’s still time, and maybe even some hope. We can stand up for each other. We can stand up for tolerance and against cruelty. We can stand up for love and against hate. We can reach across the divide and rebuild bridges without throwing already-vulnerable people into the firing line. We can stand against fascism, and we can win. That, in essence, is how you can still be a soccer fan now. By realizing that it’s not just about soccer anymore.